1. Development Feasibility: that assist on the financial outcome of the development. 2. Development Management: manages development projects from start to end. 3. Corporate Consolidation: property portfolio. 4. Hotel Feasibility: Model revenue and expenses on hotel models. 5. Investment Appraisal: calculate property value and return rates. the software is becoming to industry standard from its adaptability and efficiency, used by 1000 companies and 10,000 users internationally. For example, valuers, property consultants, fund managers, property developer, and governments. It is easier to adapt and use than spreadsheet which means clients can use the excel functions/ calculations in easy understandable ways. Also consistency, transparency and efficiency are the strong element to allow sharing information between peers that minimises errors through strict discipline and test models to ensure the efficiency of the software. In addition, reducing risks through sensitivity and probability analysis to make more reliable predictions. Can convert into Excel or Word document. An important asset in this software is the feasibility analysis. It gives the managers/ owners the key tools to assist decision-making processes. Particularly the scenario analysis, sensitivity and probability analysis help to make the final decision on investment and managements decisions. It provides information on whether the project is acceptable or should be rejected. We primarily look at time value of money, percentage of investment returns, cover of expenses, potential growth rates . On the other hand, these analyses need to update accordingly due to external influences such as an up or downward growing economy or government policy changes. Which means the managers have to identify the likely fluctuations and adjust to the real world as the software can not keep up to date with these changes it self. Will Estate Master software stand the challenge of time? I found an interesting longer term supporter of Estate Master and have been giving some feedbacks to the software. 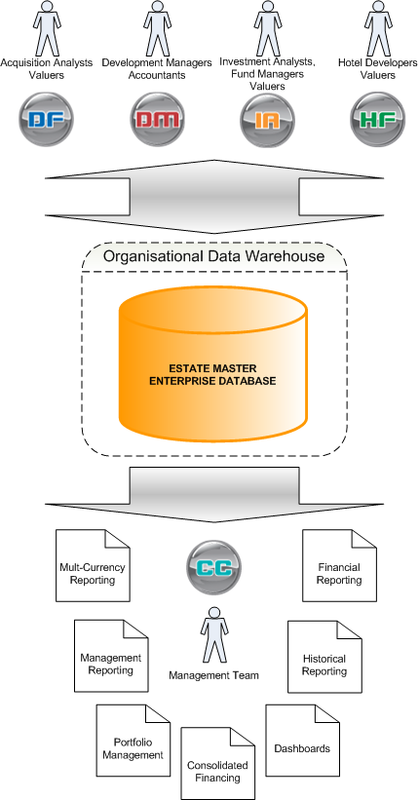 Stephen Philp is the Head of Capital Transactions at Colonial First State Property has been using Estate Master for the last four years. With over AUD$15 billion of combined funds and assets under management, Colonial First State Property is one of Australasia’s leading property fund managers. Mr Philp is a current user of the Estate Master DF and Estate Master DM models for property development feasibility and development management. He believes the popularity of Estate Master within the property industry is because it is so easy to use. “I think that is one of the key factors to why the market has adapted to it so readily. The people that we deal with understand it. It takes into account the more complicated things that have come into the development industry like GST and stamp duty, other equity and hybrid type debt structures. ← WHY Geographic Information System?